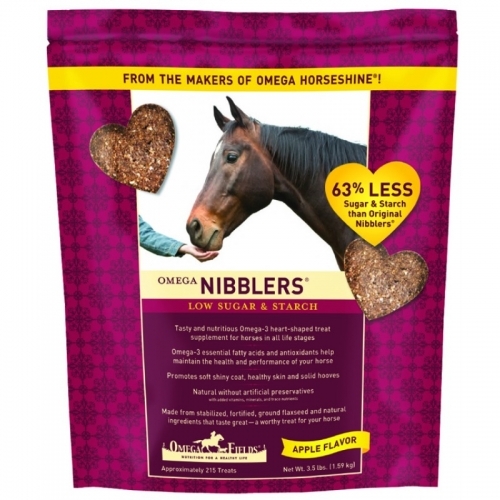 Omega Nibblers® Low Sugar & Starch are tasty and nutritious Omega-3 heart-shaped apple flavored treat supplement for horses in all life stages. Made from stabilized ground flaxseed and natural ingredients that taste great – a worthy treat for your horse! Low in Non Structural Carbohydrates – Sugar 6.7% and Starch 7.4% Feed Omega Nibblers® Low Sugar & Starch as desired for training, trail riding or as a nutritious anytime treat. Feed 15 Omega Nibblers® Low Sugar Starch treats per day as a tasty alternative to 1/2 cup Omega Horseshine® for a 1,200 pound horse. Omega Nibblers® Low Sugar & Starch are a great tasting and functional treat containing the best ratios of the full spectrum of natural Omega EFAs – higher in 3 & 9, lower in 6. You can have confidence in the Premium, Human-Grade, Non-GMO, 99.9% Pure, Stabilized, Ground, Fortified Flax we use in our Omega Nibblers® Low Sugar & Starch formula. Proprietary stabilization technology provides a stable, ground, fortified flaxseed composition as a rich source of Omega-3 in the diet.